Etruscan civilization flourished in Italy from the 9th through the 1st century B.C., when the Etruscans were integrated into the Roman Empire. Little is known about their origin, and their language is only partially understood. Nevertheless, cultural achievements of the Etruscans influenced Mediterranean cultures and played an important role in the development of Roman society. Among the Etruscan contributions traditionally attributed to the Romans are the arch, the invention of concrete, Roman numerals, and the toga. The production of mirrors in Etruria, located in what is now Central Italy, began during the second half of the 6th century B.C. Thus far, these luxury items have been discovered in women's tombs only. The non-reflecting or reverse side is often engraved with scenes of daily Etruscan life and mythology. 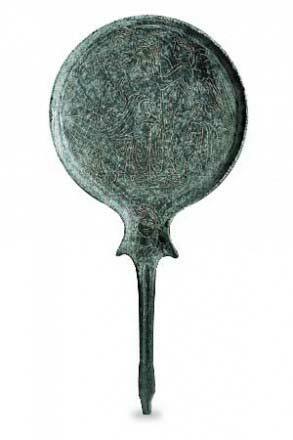 The Cummer Museum’s mirror, cast in one piece, is incised with a scene of adornment. The woman is seated on a stool surrounded by items related to her toilette. A winged hermaphrodite stands poised to crown the woman with a wreath, while a bird brings her a necklace in its beak. The seated woman has been identified as Malavisch, the Etruscan name for a figure associated with wedding rituals. Scenes of bridal adornment are common on Etruscan mirrors, supporting the opinion that these objects were given as wedding gifts.